Summary Second gen+ Broadcom-based AC1900 router with USB 2.0 & 3.0 drive and printer sharing and PPTP VPN server. Some of the resident AC router fanboys over in the Forums are about to pop a blood vessel in anticipation of the first AC1900 class routers and trying to decide which to blow $200+ on. So I figured I'd better get something up sooner vs. later so that they have an alternative to the somewhat breathless reviews that other sites are posting. 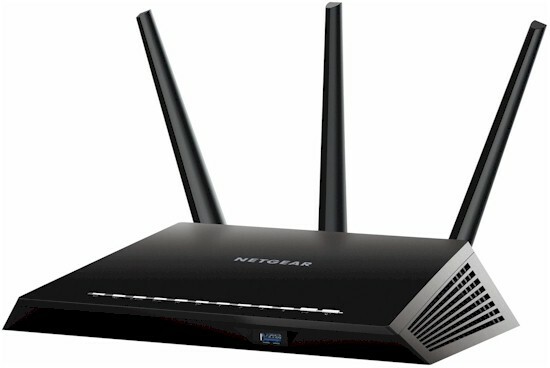 Rest assured that full reviews for NETGEAR's R7000 "Nighthawk" and ASUS' RT-AC68U will follow in the coming weeks. As I explain in this short AC1900 primer, not many people will be able to experience the 600 Mbps link rates in 2.4 GHz that are the raison d'être for the AC1900 stew that Broadcom has cooked up. The only folks who will are those who spring for two routers and set the second up as a wireless bridge. Even those who have the only AC1900 client device that exists—ASUS' PCE-AC68—will likely be disappointed. ASUS sent one along with the router and I was not able to get a link above 450 Mbps on the 2.4 GHz radio. So after wasting an afternoon trying to coax a 600 Mbps link, I fired off emails to ASUS and Broadcom to let them know of the problem and fell back to my trusty old PCE-AC66. Broadcom came back after a few days and confirmed that TurboQAM is not enabled by default in the PCE-AC68 driver. So ASUS is supposedly working on a new driver that will flip the proper bit. The gist of this is that this first look tests both products as AC1750 routers. If you're looking for AC1900 results, you'll have to wait for another week or so. Most people don't even have AC580 or AC867 class devices anyway and buy AC routers for the folly of future-proofing or in hope of improving wireless throughput and/or range for existing G and N devices. The other question on your mind is likely to be "where's the Linksys EA6900"? Well, it seems that Linksys has a copy of the Octoscope MPE-based test setup I use and didn't like the results they were seeing when they checked the first batch of routers before sending them out for review. So they missed the window to be included in this review. Because there has been a lot of speculation about the innards of these beasties, I opened both of them up after testing was done. Table 1 tells the tale. The R7000 sports a Broadcom BCM4709A SoC, while the RT-AC68U uses the Broadcom BCM4708A. 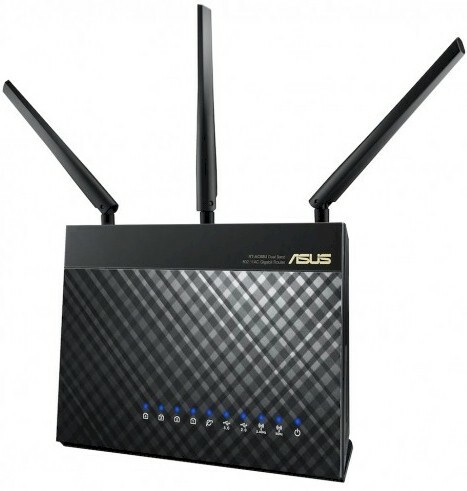 We've seen the second-generation BCM4708 in other second-round AC routers like the recently-reviewed ASUS RT-AC56U and Buffalo WZR-1750DHP. Here's a look at the top of the R7000 board with its RF covers removed so you can see the two BCM4360 radios. The small devices to the left of the photo are the 2.4 and 5 GHz amplifiers that sit side-by-side to feed each antenna. There are more internal photos in the gallery below. The last photo shows a very large heatsink that sits at the bottom of the router and that is directly thremally-coupled to the RF shielded compartment that houses the BCM4709 SoC, RAM and flash. This is the view when you remove the cover. View with board removed and turned over. The grey pads thermally couple the main CPU and memory compartment to a very large heatsink in the bottom of the enclosure. The black tape is to reduce RF noise from the USB 3.0 connector. Here is the same view with the RF can top removed, exposing the Broadcom BCM4709 SoC, RAM and flash devices. Here is the top view with the RF shield top removed. Those are two Broadcom BCM4360 3x3 802.11ac radios. The 2.4 and 5 GHz amplifiers sit side by side for each antenna channel. A large metal heatsink sits on the router floor. You can't see it in this crappy photo, but both sides have metal fingers that extend to the side areas where cover grilles allow unobstructed bottom to top airflow. There is no fan in the router. Here is a similar view of the ASUS board. It uses the same alternating arrangement for the outboard 2.4 and 5 GHz amplifiers. You can see one of the pads that thermally couple the amps to the RF compartment cover. All the devices have similar thermal coupling. This view greets you when you pry off the top cover. You'll need to remove two screws hidden under the large label on the rear. The heatsink is coupled to the board bottom via a thermal pad. It sits beneath the RF amplifiers. Removing the board and flipping it over shows the large heatsink that covers two RF enclosures. Same view with the heatsink and RF enclosure tops removed. The BCM4708 SoC and RAM are in the right compartment, the two BCM4360 3x3 802.11ac radios and RF amplifiers are in the left box. It's interesting that the same alternating amplifier arrangement is used in the R7000. This view shows the heatsink removed. Note there is no shielding applied to the USB 3.0 connector area on either side of the board. According to Broadcom, the main difference between the two processors is that the 4709 has a 1 GHz clock speed per core, vs. 4708's 800 MHz. The 4709 also supports faster DDR3-1600 memory and has "some other I/O" differences. So there is no overclocking involved, folks. NETGEAR simply chose a faster processor for the Nighthawk. Does NETGEAR (or ASUS for that matter) run the processors at full clock speed and do they enable access to all 256 MB? Who knows? All that matters in my book is performance, so let's get right to it.